With Directory Information you get a single point to broadcast your customers’ phone numbers to the major number listing services. 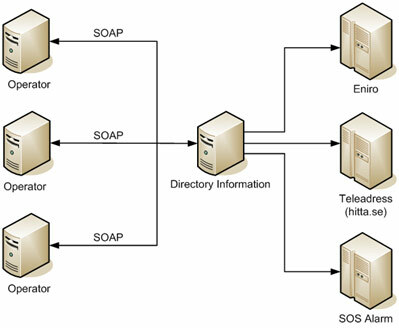 With Directory Information an operator gets a single SOAP link with operations to broadcast the customer data to Eniro, Bisnode and SOS alarm; the major number listing and emergency services in Sweden. All it takes is a single command and the number gets listed, changed or removed within 24 hours ¹.
Directory Information is secure and only shares secret number listings with SOS alarm, the national emergency service. By doing so the customer gets full privacy while still receiving the security of being traceable in case of emergencies. Assign multiple persons to a single number by creating families and c/o connections. ¹ The listing services update their information once every 24 hours. Store the data as you wish – you may keep your current CRM system and only implement the connection to Directory Information. Directory Information handles all of the communication to the end point services so there is no need to implement new file formats or data structures. The CRM may instantly add, edit or delete data in Directory Information as the customer data changes. It is you, the operator, that owns the contracts to the listing services; the operator keeps ownership over the customer data and receives all of the profit for submitting the numbers.